Mystic Aquarium	has dozens of living marine life exhibits and over 6000 sea creatures in the main tank. 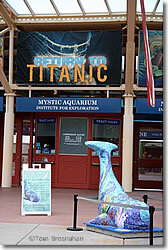 The Mystic Aquarium has 48 living marine life exhibits and over 6000 sea creatures in the main aquarium. Marine mammal demonstrations, held every hour on the half hour, feature California sea lions in the Marine Theater. An outdoor exhibit area called Seal Island lets you watch five species of seals and sea lions (including endangered Steller sea lions that can weigh up to 1700 pounds/771 kg!) sport and play in re-creations of their natural habitat. There's a colony of 30 African penguins, and three beluga whales, as well. Exhibits change from time to time, and often feature the fascinating discoveries of deep-sea explorer Dr Robert Ballard, who led the team that found the wreck of the Titanic. To find the aquarium, take Exit 90 from I-95, and follow the signs (map). Plan your visit in conjunction with a visit to nearby Mystic Seaport Museum and the pretty towns of Mystic and Stonington. Entrance to the Mystic Aquarium, Mystic CT.